How to set up 'parent/child' data relationships using repeatable sections in Fulcrum templates. 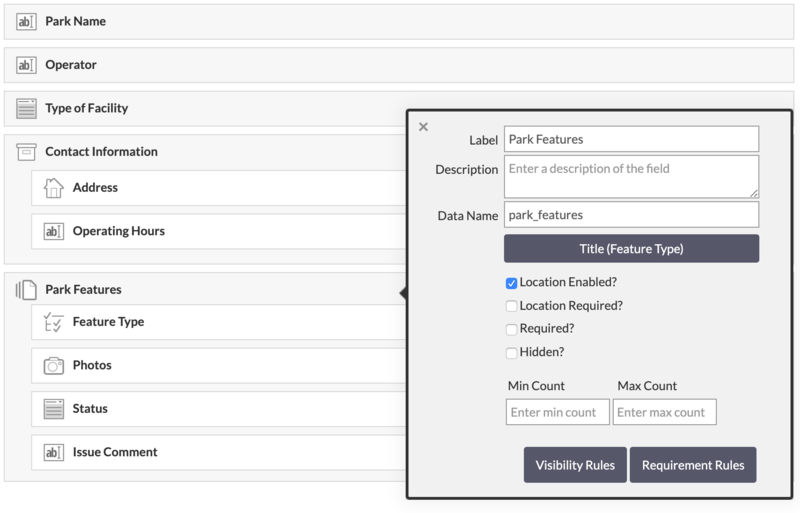 Repeatable sections allow you to nest “sub-forms” within a larger form, creating multiple child records that are associated with the parent record. While the data is inside of Fulcrum, child records can be accessed through the main parent record or by selecting the repeatable field from the app drop-down menu on the record editor page of the web app. When exported, the record id of the parent record serves as the unique id that can be used to link the child records to the main parent record. Every child record captured can have it’s own unique location and data associated with that record. Along with having their own location, you can set the minimum/maximum number of child records (using validation) that a repeatable section can have, set the child record record title. Additionally, each child record has its own timestamps. To nest fields in a repeatable section, you will want to drag the field more towards the center of the app designer and over top of the section that you want to nest it in. If you’re looking to import data this type data, please see our guide: Import Data into Repeatable Fields. Repeatable sections are only available on select plans. Please check out the plans page to see which have access to repeatable fields.